Yeahhh, that guy. In a nutshell, John is an American film maker, (with a huge cult following), actor, and writer. About a month ago, WORD Brooklyn sponsored an event during which Mr. Waters talked about his most recent book Role Models. Admittedly, I’m not the world’s biggest John Waters fan, (nothing against him, I just wasn’t into his stuff), but my friend had a ticket and couldn't attend, so I went in her place, thinking "What the hell?" During the talk, I felt like a bit of an imposter standing there in this crowded hipster bar with people around me crying because they were in the presence of John Waters (who, by the way, was absolutely gracious and wholly entertaining). When it was my turn to get a book signed, I felt a bit panicked because I had absolutely nothing to say to Mr. Waters. I hadn’t seen many of his movies, so I couldn’t connect with him on that level, and I was only a few chapters into his most recent book (and hadn't read any of the others). Subsequently, I did the most natural thing I could think to do: I talked about libraries. John Waters: “Okay, great.” (There’s an awkward silence as he signs). (That was true. When I initially tried to put a hold on Role Models at the library, all copies were out). John Waters: "That's great! You know, there was a time when my book wouldn't have even been allowed on the shelf." Hey! He gets it! We engaged for a moment! We connected! I walked away feeling satisfied that I had done some kind of roundabout library advocacy, and I mentally promised to make finishing Role Models a priority. (I still haven’t finished it. It’s in the to-read pile. On top). I always find it a bit weird meeting authors - I'm always horribly disappointed to read interviews with William Gibson, for example, because he doesn't actually seem to like technology! I remember being oddly uncomfortable meeting Jasper Fforde, and although it was cool to meet Iain Banks, who is a lovely chap, he's still quite normal for someone who writes such extraordinary books! I guess it depends on the author and your relationship with his/her books. 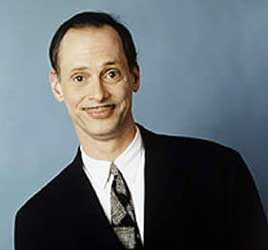 John Waters is more of a phenomenon than simply an author, though. Either way, he was extremely pleasant!